So I don’t know who here really watches anime. Or who all reads my blog at all now thanks to my random recent postings. Hello all! Let’s keep it really random, shall we? 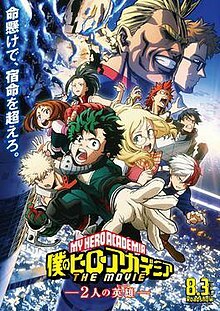 This week I give you the first movie from the really popular anime series My Hero Academia; My Hero Academia: Two Heroes. Our main hero is Izuku Midoriya voiced by Justin Briner (Lord Vermillion *Series, Dragon Ball Z Kai *Series) who is joining his teacher and all-time superhero idol All Might; Christopher Sabat (RWBY *Series, Attack on Titan *Series) to an exclusive island known as I-Island. Now when I say All Might is Izuku’s hero I mean that in the sense that he is literally his hero. In this world, Super Heros rule the world where 95% of the human population have what the series refers to as a ‘quirk’ basically a superpower of some sort. I-Island is a destination known for top researchers and scientist to gather and work on new inventions to help and improve superheroes. The weekend that Izuku and All Might are headed to the area happens to be the weekend that the island is open to all for a huge festival to showcase all the greatest inventions. While on the island the duo meet up with Melissa Shield voiced by Erica Mendez (Aggretsuko *Series, Berserk *Series) All Might’s sort of niece and her father and good friend of All Might, David Shield voiced by Ray Chase (Lego City *Series, Cyborg 009: Call of Justice *Series). All Might isn’t just Izuku’s hero. He’s probably the worlds most well known and well-loved hero. So once everyone finds out that All Might is there he becomes an obvious guest of honor at the expo’s swanky dinner awards that night. As the movie progresses we find out (coincidentally) that all of Izuku’s friends and classmates are on the island for the expo also. Not only that but we also find out (coincidentally) that they’re all invited to the dinner awards as well. But just as the big night begins danger stricks! In a world full heroes, it’s only natural that there would be villains too. That introduces the character Wolfram voiced by Keith Silverman (Wakfu *Series, Pokemon Generations *Series) who takes down the swanky party with a group of villains in a radical takeover quickly immobilizing all the heroes there including All Might. If that’s not bad enough the bad guys have found a way to take over the defense system’s and manipulate it to make everyone on the island a hostage. Wolfram has come into the knowledge of a very incredible piece of technology that can enhance and power up a quirk making your powers insanely invincible! It’s there on I-Island and he wants that technology for himself. So with All Might and the other superheroes down for the count, it’s up to Izuku, Melissa and his friends to save the hostages and bring down Wolfram! Anyone who has ever watched the My Hero Academia series probably knows that this is basically X-men in Anime form (Wolfram even makes up for a kind of bootleg Magneto). Schools full of teenagers with incredible powers training to be superheroes. It’s been done so why bother? Actually, there are a few reasons why you should bother. First and foremost is the main character Izuku Midoriya who over the series has such an amazing character development. He, unfortunately, is one of the 5% of humans who is born without a quirk, having always dreamed of becoming a hero that was a hurdle he had to bear then overcome. (How does he do it and gain powers you’ll have to watch the series to find out.) But the movie is great because it touches base with that. Melissa informs that she was also born without a quirk and that gives the two main characters a real special bond that grows stronger as the movie progresses. Another reason to bother is because of all the great characters from the show! There’s a lot so I won’t go over them all but it’s always refreshing to find a show or movie which draws strength from its support characters. All who have their own really cool and unique powers and all have something to attribute to the movie. I believe that the series itself is such a big hit just because the characterization is always shifting informing the viewer that each character has their own reason to become a hero. And another reason to bother: This movie really hits the ground running! As it’s first-time movie debut they did not disappoint! The theater was packed (which is impressive to see for anime on the big screen) and the fans seemed satisfied. Extremely satisfied seeing as how I ended up at the screening with a mega fan! The only thing I found to be annoying was how all of Izuku’s friends showed up conveniently one by one to the point it became comical…and not in a good way. But that’s the only take away I can give to this movie honestly. Rated PG-13 for intense fighting scenes and gun use. Rotten Tomatoes has this fast-paced action comedy at a 97% fresh! I will say that maybe watching a few episodes of the series My Hero Academia would help with this movie. Not that it would confusing but because the many characters would…well yeah. With all the characters I guess it may come off as confusing. A little bit. However, if you are a fan you owe it to your self to see this movie. Actually, if you are a fan…why haven’t you seen this movie? Two words: Worth it.